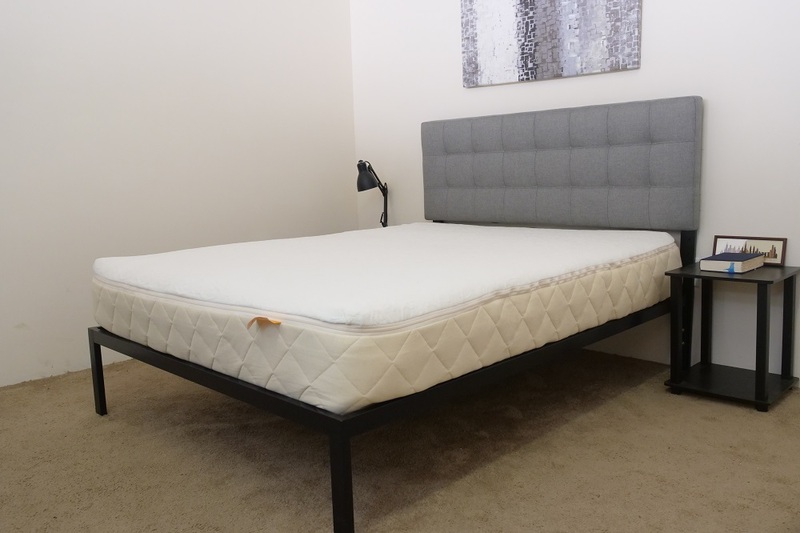 Happsy Mattress Review - Should You Buy an Organic Mattress? Bed-in-a-box retailer Happsy has emerged on the scene with the goal of providing its customers with a healthier sleep. How does it plan to do this? By designing a green mattress outfitted with wool batting, organic cotton and all-natural latex. While these materials are sure to prick the ears of eco-friendly sleepers everywhere, I’m not going to get too excited about this bed until I’ve put it through my tried-and-true tests to see how comfortable it actually is. And who knows! Maybe it’ll end up being the bed of your dreams. 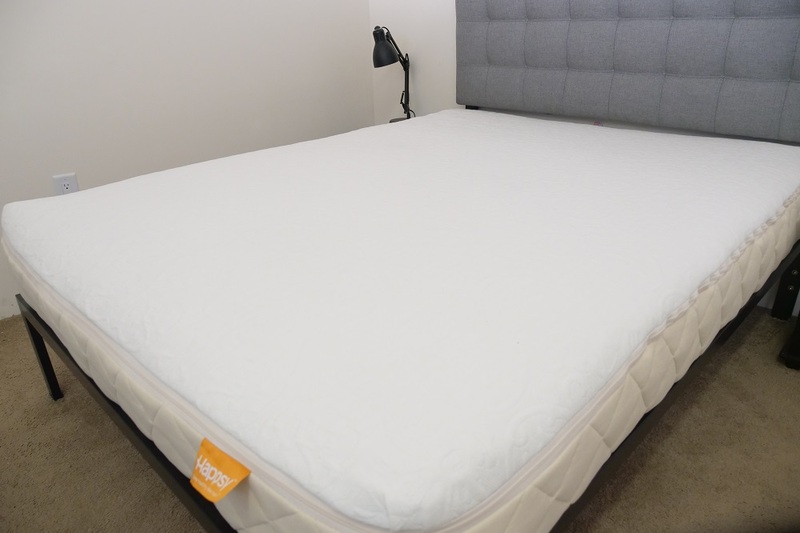 Continue reading below for my full review of the Happsy mattress. Don’t have time to read it all? Click here to skip to the bottom and check out my review summary. The Happsy is built with a hybrid design of cotton fill, latex foam and spring coils, measuring up to a total 10” of comfort. As with other hybrid constructions, the intent is to produce a sleeping experience that’s as pressure-relieving as it is supportive. The use of latex and pocketed coils also helps to prevent the structure from overheating. To see how all these elements work together, let’s dive into the bed’s construction. Cover – The cover is crafted out of a knit organic cotton blend, making for a super soft and cozy material. You’ll also find a thin layer of organic wool batting quilted into the cover, which produces an even more gentle hand feel. I should add that wool is great at absorbing heat and wicking moisture, so you’re not likely to overheat while you sleep. Comfort Layer – Directly below the batting, you’ll find a 2” layer of all-natural latex. This material has a quick response to pressure, providing the sleeper with some pleasant lift that’ll position the sleeper “on top” of the bed as opposed to “in” it. Latex is also fantastic at cooling, so this section will extend the temperature regulating properties of the top materials into the rest of the mattress. Foundation Layer – The foundation is built with 8” of pocketed springs. This section doubles down on the bounce of the latex comfort layer, endowing the structure with its buoyant lift. I should note that since these springs are individually wrapped, they’re going to do a great job of isolating motion and encouraging airflow throughout the bed. After taking a look at the construction of the Happsy, let’s chat about the firmness and feel. I started off by applying light hand pressure to the mattress and found that I was immediately interacting with the soft latex layer. While i was able to press into this layer easily, I didn’t really feel any contouring or sinkage. Pushing in further, I encountered the supportive coils, which lifted me up and out of the structure. At this point, I’d like to note that people of different body types and sizes are going to feel firmness differently. For that reason, I enlisted three other people to help me figure out the firmness of this bed. We each took a turn lying on the mattress, determined our individual firmness ratings and then compiled them on the graph below. 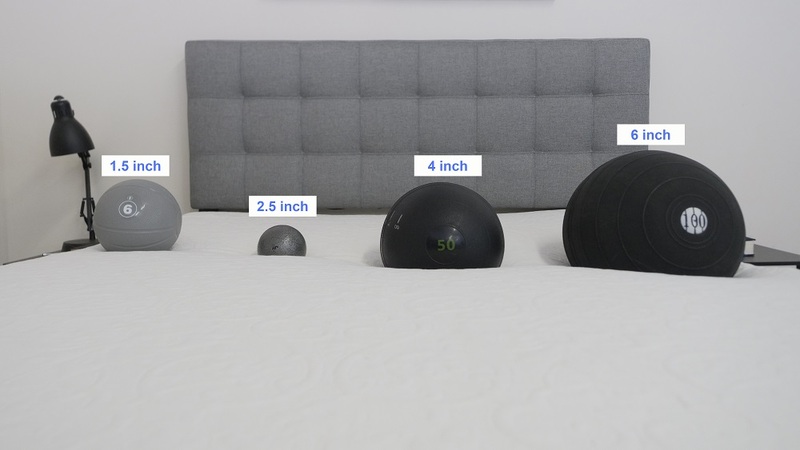 While feel and firmness is always going to be a personal thing, this will hopefully give you a better sense of the range you can expect from the mattress. Though there was a bit of discrepancy among my testers, we landed on an average firmness rating of 6 for the Happsy. 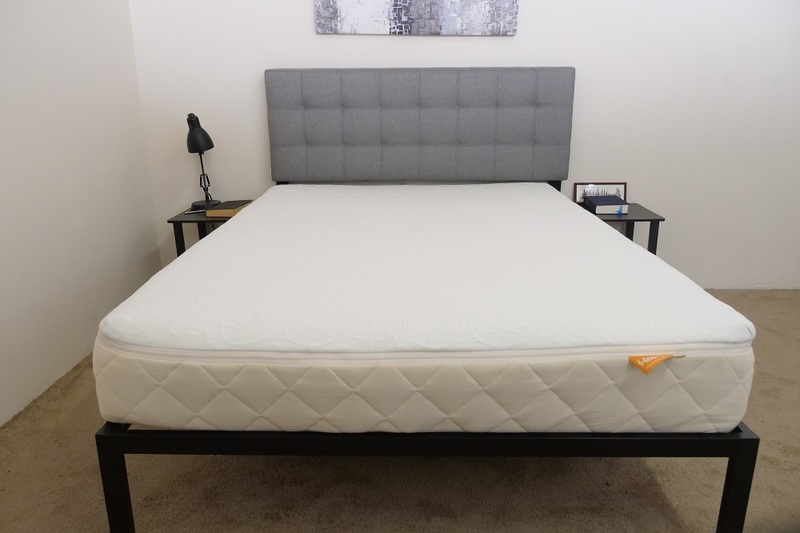 When compared to the industry standard of 6.5 for medium firmness, it seems as though this bed is just a soft toucher than medium firm. I personally gave the Happsy a 6. While you’ll sink into the top latex layer for some pressure relief, the lift of this material combined with the bounce of the pocketed coils will likely keep you positioned on top of the bed. Overall, this produces a nice balanced feel. Rather than just telling you how the Happsy feels, I thought I’d provide a visual representation of where someone might feel pressure points form while lying on top of it. Back – Lying on my back, I felt as though my weight was pretty evenly distributed across the surface. The latex comfort layer did a good job of keeping my spine in a nice alignment, which alleviated pressure in my shoulders and lower back. Since I was mainly interacting with the top section of buoyant latex, I found it easy to move around and change positions. Side – Rolling onto my side, I was extra conscious about the formation of pressure points at my shoulders and hips, typical problem areas for side sleepers. 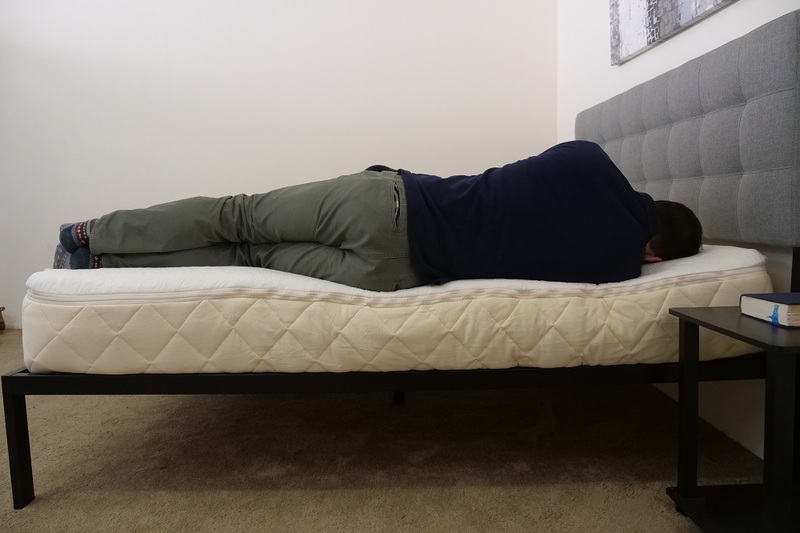 Though this bed doesn’t produce a lot of contouring, I still felt some nice relief and comfort in this position. 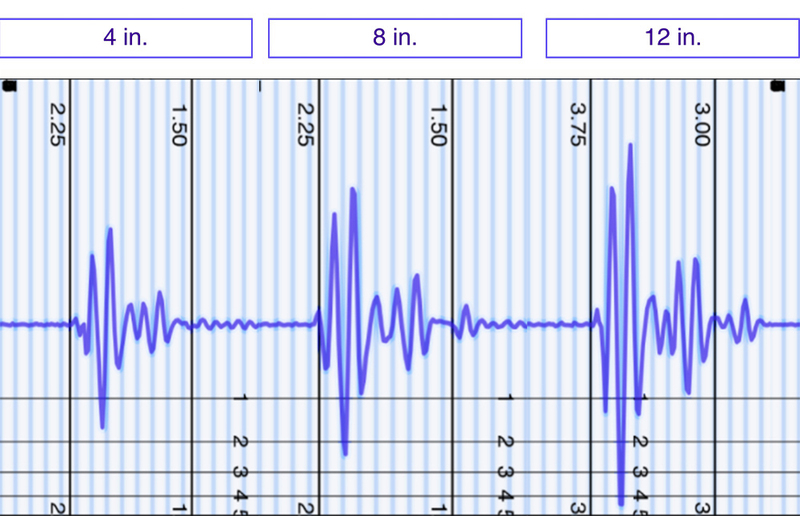 As you can see in the graph, the pressure formation was subtle at most. Stomach – I personally found the Happsy to be on the softer side of medium firm, so did detect a bit of pressure at my chest and hips in this position. Stomach sleepers tend to prefer firmer beds as they prop up those problem areas on top of the structure thereby creating an even spinal alignment. Next up, let’s chat about motion transfer, or the amount of disturbance you’re likely to detect from one side of the bed to the other. This test will be especially important for those of you planning to share your bed with a partner, as it’ll let you know just how bothered you’re going to be by their frequent trips to the bathroom in the middle of the night. I’d say these results are fairly consistent with ones I’ve seen from other latex hybrids on the market. The bounce of the latex foam coupled with the spring of the pocketed coil system creates a lively structure that responds quickly and intensely to movement. 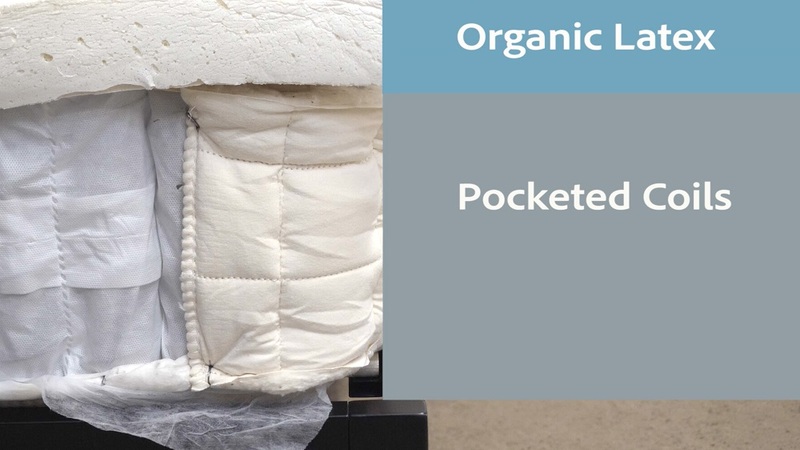 However, since the pocketed coils are individually wrapped, a lot of this motion is going to be absorbed and dissipated throughout the mattress, dampening the overall effect. Long story short: you’re likely to feel your partner moving around at night, but it shouldn’t disturb you too much. 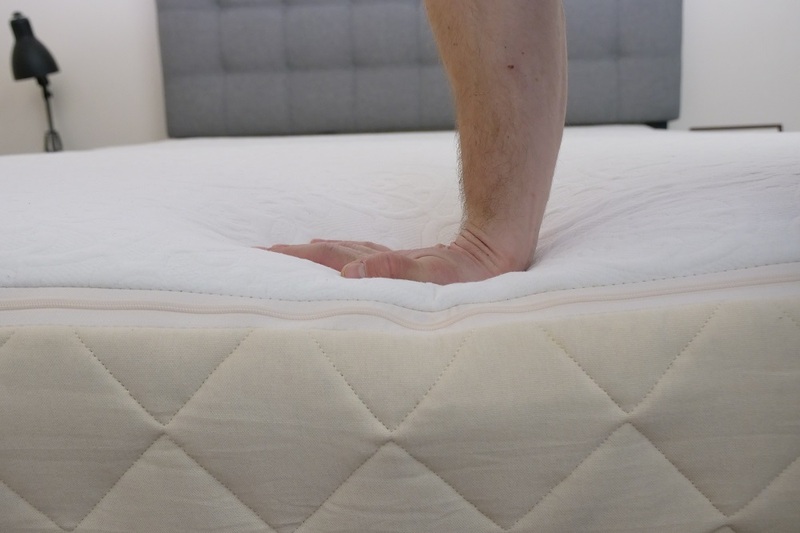 Another important factor to consider when buying a new mattress: sinkage! This attribute will let you know whether you’re going to feel like you’re sinking “into” the mattress or lying “on top” of it. Overall, these results are just above average for a mattress of this design. Though there’s a lot of bounce to this bed, you’re likely to sink quickly through the latex comfort layer for some nice pressure relief. However, this sinkage doesn’t mean you’re going to be stuck in the bed; on the contrary, the responsive nature of the materials used here will keep you buoyed on top of the structure. And finally, edge support, which will be most relevant for those of you who are going to share your bed with a partner and need to use the entire surface area of the mattress. Lying on my back near the side of the Happsy, I experienced a pretty similar feeling as I did while lying in the center. As I scooted closer to the edge, I began to notice some compression through the top latex layer, which you can clearly see in the photo above. This didn’t affect my overall security, however, as the pocketed coils continued to support me in this position. As you’ll note in the photo, once I turned onto my side, I began to experience deeper compression through the comfort layer. You’ll notice how the latex conformed to my shoulders and hips, providing much needed pressure relief to these problem areas. For all this, I was still solid at the edge and never felt like I’d roll out of the bed. Here, I wanted to demonstrate what it would feel like to be sitting up in bed while getting ready for the day, maybe lacing up your shoes or slipping on some socks. A lot of mattresses experience severe compression in this position, but the Happsy actually held up really well. If you’re convinced the Happsy is the right mattress for you, the size and pricing information for the mattress are below. Sleepers in search of organic materials – If you’re in the market for a green bed, you’ll find a lot to love in the Happsy. Outfitted with organic cotton, wool batting and all-natural latex, this mattress is as eco-friendly as it is comfortable. Anyone in need of some serious bounce – Thanks to the buoyant latex and pocketed coil system, the Happsy is a very bouncy mattress. 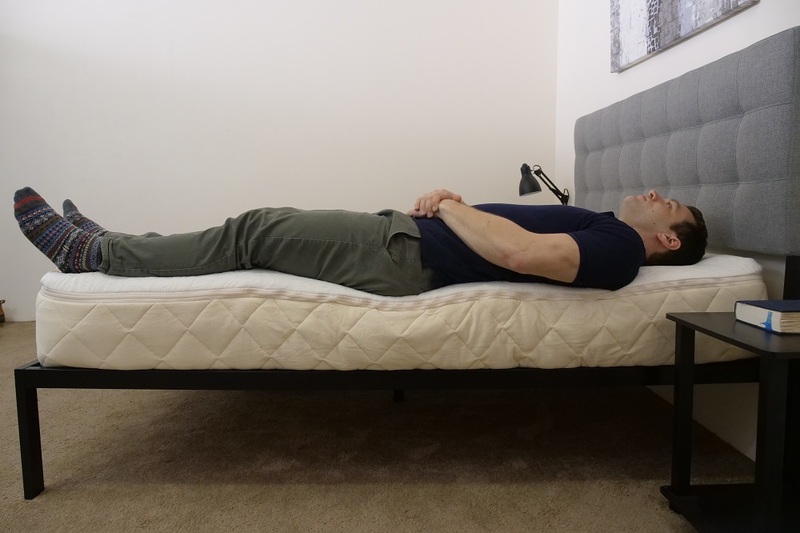 This will please a lot of sleepers, particularly those who need to be able to change positions easily or simply want to feel as though they’re sleeping “on top” of their mattress. Sleepers who want a breathable bed – This mattress is also extremely breathable, due in large part to the perforated surface on the latex layer and the space between the wrapped coils in the support system. This airflow is going to keep things cool, working to regulate temperature throughout the structure. For more information on the Happsy, visit its website here!